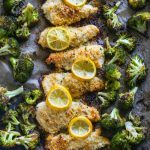 Healthy tender lemon chicken with crispy roasted broccoli is baked in one pan and ready in under 20 minutes! Quick and easy meals are the only type of recipes in my dinner rotation this summer. We are prepping for the summer heat, a vacation, and lots of outdoor fun, so cooking is the last thing I want to worry about! 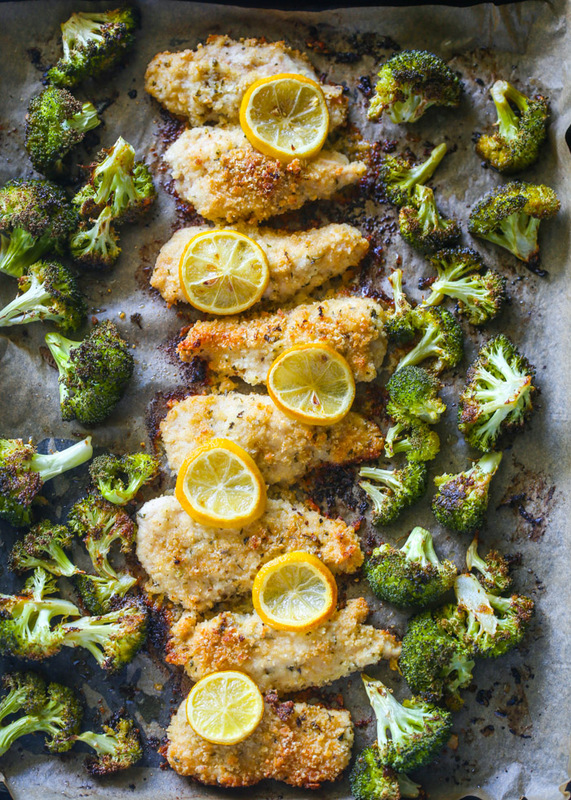 You know how much I love healthy dishes that are also quick and delicious and this one pan baked lemon chicken and broccoli is just that. The entire dinner is baked in just one pan and is sooooo good! plus, it bakes in just 20 minutes, so that’s a huge plus! The chicken is dipped in a lemon, butter mixture and then coated with panko breadcrumbs and parmesan. On the side I like to add broccoli because they cook at the same rate but asparagus, zucchini, or green beans will also work. Preheat oven to 400F. Line a baking sheet with foil or grease with oil; set aside. Cut chicken breasts in halves then into long tenders about 2 inch wide. Combine the panko breadcrumbs and parmesan cheese in shallow bowl and set aside. Combine the lemon juice and zest, butter, garlic powder, and italian seasoning in another bowl. Add broccoli to the pan. Spray chicken and broccoli with cooking spray or drizzle with a tablespoon of oil. Lightly sprinkle broccoli with parmesan cheese. Bake 20 minutes or until chicken is golden and tender and broccoli is crispy. Omg this is an easy and tasteful recipe. Big hit in my house! The flavour was delicious, although the chicken topping was soggy 🙁 The broccoli was not crispy. With a few adjustments, it could be great. Followed the recipe but used seasoned Panko instead of regular Italian bread crumbs. The flavor was great, but the coating was very soggy. Might want to pop the chicken under the broiler for the last minute of cooking to get brown . I followed recipe exactly and it was really good excet, the only thing I didn’t like was the lemon on top because it made it soggy and had to much of a lemon taste.Will make again without the lemon on top. Followed the recipe exactly, except with gluten free bread crumbs. Quick and delicious! Time to redo this recipe…….Brocolli was over cooked and dry…..each chicken piece had lemon wedge on them preventing them from browning and crisping…..
Could be good with rebuild. Too much lemon!! I didn’t know what you meant about Juice and Zest of 1 lemon so I Googled and ended up using ~2tbl spoons of lemon juice. I ran out of the butter lemon juice mixture even though I used that much lemon juice and an extra tablespoon of butter. 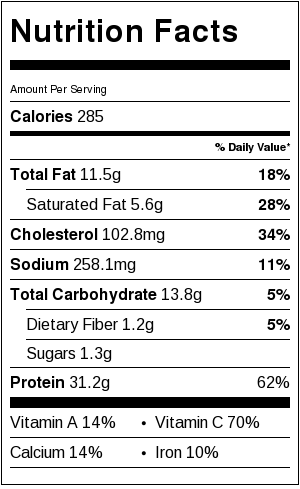 The taste was fine other than the extreme tang. Happy to find this idea ! Greta photo, too ! Thank you and have a nice week !